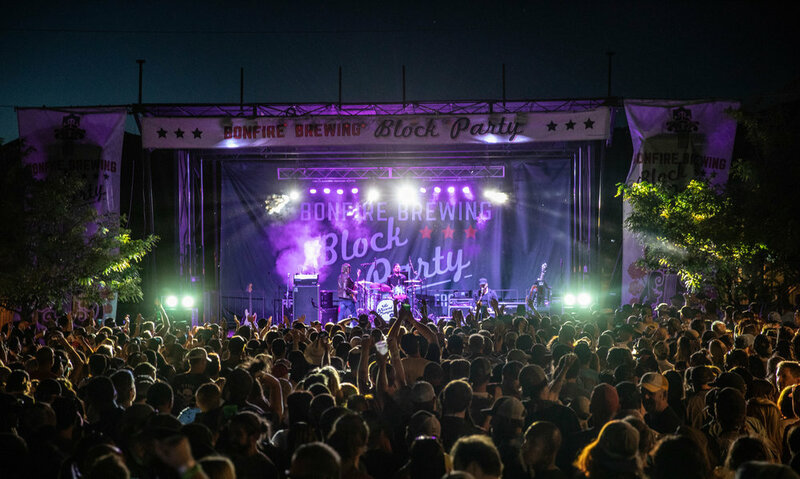 EAGLE, CO— Bonfire Brewing and Optimum Events once again team up for the fifth installment of the Bonfire Block Party, an annual street party slated for May 31 – June 2, 2019 in Downtown Eagle. A special holiday pre-sale starts Friday for all 2019 Block Party tickets including Two-Day General Admission Wristbands, Two-Day Sili Packages, a Two-Day VIP Experience and a Sayonara Sunday closing concert. The Bonfire Block Party is the two year-winner of the Best of Vail’s Best Summer Festival and showcases nationally-renowned bands, along with food vendors and Bonfire Brewing craft beer releases. As in years past, a portion of all proceeds benefit nonprofit partner, The Cycle Effect. The limited holiday sale offers the guaranteed lowest ticket prices for the 2019 event. New for 2019, the Block Party will feature three stages and an expanded VIP Experience for concertgoers. 2018’s event featured two stages and an inaugural VIP Experience that sold out to rave reviews. 2019’s VIP Experience includes a covered tent with seating, dedicated viewing area, complimentary catered dinner, full bar service, Bonfire craft beer and a 2019 branded glow-in-the-dark SiliPint tumbler. While supplies last, the Block Party holiday pre-sale pricing for two-day VIP tickets is $100 per person, two-day general admission wristbands are $25, two-day GA tickets with a branded 2019 SiliPint (Sili Packages) are $40 and the Sayonara Sunday concert is $35 and includes a complimentary catered breakfast. All prices will increase when Early Bird ticketing begins. An unprecedented 13 bands will play over the two-day event on the Broadway Main Stage, second stage and the Bonfire Side Stage, adjacent to Bonfire Brewing in Eagle. The full music lineup will be released in early 2019. Past musical acts include The Record Company, Galactic, Sam Bush, Dirty Dozen Brass Band, Robert Randolph & The Family Band, Con Brio, Tea Leaf Green, Nicki Bluhm and more. For more information and to purchase tickets online, visit www.bonfireblockparty.com.